The T*AFSM is developing advanced methods to simulate different deployment stages of various parachutes systems. The methods take into account the fluid-structure coupling between the aerodynamics of the parachute, which depends on the instantaneous shape of the parachute, and the deformation of the parachute, which in turn depends on the aerodynamical forces acting on the parachute. The core method used in these computations is the DSD/SST formulation [1-10, 16-17, 19], which was developed by the T*AFSM for flow problems with moving boundaries and interfaces, including fluid-structure interactions. 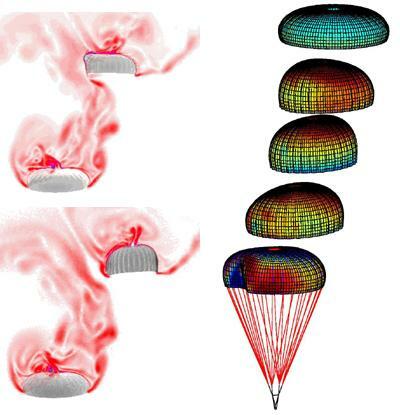 With the techniques developed, simulation and modeling of a wide range of parachute applications have been carried out [11-15, 18, 20]. 11. K. Stein, R. Benney, V. Kalro, T. Tezduyar, J. Leonard and M. Accorsi, "Parachute Fluid-Structure Interactions: 3-D Computation", Computer Methods in Applied Mechanics and Engineering, 190 (2000) 373-386. 12. T. Tezduyar and Y. Osawa, "The Multi-Domain Method for Computation of the Aerodynamics of a Parachute Crossing the Far Wake of an Aircraft", Computer Methods in Applied Mechanics and Engineering, 191 (2001) 705-716. 13. T. Tezduyar and Y. Osawa, "Fluid-Structure Interactions of a Parachute Crossing the Far Wake of an Aircr20aft", Computer Methods in Applied Mechanics and Engineering, 191 (2001) 717-726. 14. K. Stein, R. Benney, T. Tezduyar and J. Potvin, "Fluid-Structure Interactions of a Cross Parachute: Numerical Simulation", Computer Methods in Applied Mechanics and Engineering, 191 (2001) 673-687. 15. K. Stein, R. Benney, T. Tezduyar, J. Leonard and M. Accorsi, "Fluid-Structure Interactions of a Round Parachute: Modeling and Simulation Techniques", AIAA Journal of Aircraft, 38 (2001) 800-808. 16. Tayfun E. Tezduyar, "Finite Element Methods for Flow Problems with Moving Boundaries and Interfaces", Archives of Computational Methods in Engineering, 8 (2001) 83-130; also in Lecture Series on Finite Elements in Fluids, T.E. Tezduyar, University of Tokyo, April-May 2001. 17. T. Tezduyar, "Finite Element Interface-Tracking and Interface-Capturing Techniques for Flows with Moving Boundaries and Interfaces", ASME Paper IMECE2001/HTD-24206, Proceedings of the ASME Symposium on Fluid-Physics and Heat Transfer for Macro- and Micro-Scale Gas-Liquid and Phase-Change Flows, ASME, New York, New York, CD-ROM (2001). 18. K. Stein, T. Tezduyar, V. Kumar, S. Sathe, R. Benney, E. Thornburg, C. Kyle and T. Nonoshita, "Aerodynamic Interactions Between Parachute Canopies", to appear in Journal of Applied Mechanics. Rice University MEMS Preprint 2002-017.